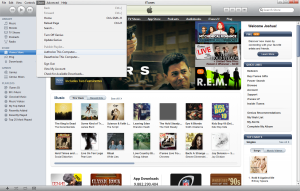 There were a few steps involved in transferring the iTunes library from Mac to PC, but overall the process was fairly simple because all of her music was organized by iTunes (rather than being scattered across multiple folders on the hard drive). This article has instructions on organizing and consolidating music into the iTunes folder if your library is not already organized by iTunes (e.g. if you have music downloaded from amazon’s mp3 service or another music download service). First we opened iTunes on the new PC so it could create the default folder structure for iTunes (located in c:/Users/USERNAME/Music/iTunes in Windows 7). On the Mac, we opened the iTunes folder (located in ~/Music/iTunes) and copied everything in that folder to an external USB hard drive (formatted with the FAT32 file system so both Windows 7 and OS X can read/write to it). We then plugged the external USB hard drive into the PC and copied all of the Mac’s iTunes files and folders into the iTunes folder on the PC. We had to modify the XML file that iTunes uses for it’s library to use Windows file paths instead of OS X file paths. To do this, we opened the file iTunes Music Library.xml in Notepad and went to the Edit > Replace… menu. By entering “file://localhost/users” in the Find what field and “file://localhost/c:/users” in the Replace with field (we are basically just adding the drive letter for the hard drive in Windows), then clicking Replace All, the XML file was updated so that all file paths worked for Windows. We then opened iTunes again and authorized her iTunes account for the new PC by going to Store > Authorize this computer… so it would work with all of her purchased content (songs, apps, etc.). Select "Authorize This Computer..." from the Store menu. Just in case, we plugged her iPhone into the Mac laptop and made a backup using iTunes on the Mac. We also synced all of her iPhone photos using iPhoto so we had a backup of those as well. Next we plugged the iPhone into the new PC. Windows installed the driver for it and it showed up in iTunes. We made another backup of the phone, performed a sync, and then updated her iPhone to the latest iOS version (4.02). iTunes displayed a few notifications about purchased content on the iPhone being absent from the library (she had purchased a few songs on her iPhone but we didn’t sync it with her old Mac iTunes library before we transferred the music, so the PC iTunes library didn’t have these new songs). iTunes conveniently let us copy the songs from her iPhone to the PC. Once her phone rebooted, we had a minor scare because all of her apps (other than the default apps) appeared to be gone. In reality they were all still there, but for some reason the iPhone inserted an empty screen between the home screen and the screen with her apps. When we scrolled to the second screen and it was blank we initially thought all the apps were gone. Once we scrolled to the third screen everything was where it was supposed to be. We also had a hiccup with her wireless network not letting her PC connect after the iPhone update (a quick reboot of her Airport router fixed this – just unplug it and plug it back in). I wonder if this has something to do with the new media streaming features of iOS. That’s it! The important thing if you attempt this is to make a backup of your iPhone on your Mac first (just in case), copy all of the iTunes library files to the PC, and then authorize your iTunes account on the PC before you plug your iPhone or iPod into the PC for the first time. If you have any tips or question, post them in the comments! Thanks for posting this! I just got a new laptop because my 6-yr old macbook was on the fritz, and my computer engineer spouse got a great deal on a pc so I am sadly leaving apple behind (except for the phone). These directions helped me do everything wit no problems at all! I appreciate that people on the web post info for the computer-shy. Many, many thanks! Thanks for the guide… worked perfectly except the playlists don’t seem to be there. 2) find the file called “iTunes Library” that has no extension. Its in the same folder as a file called “iTunes Library.xml”. 3) Copy this file in the same folder. Thanks a lot, this guide helped me out greatly! DUDE! you are such a legend! all other explainations were for PC to MAC and i was stressing out but follwed your instructions and *BAM* all music, apps, podcasts, voice memos, books all there exactly as they were on my mac. your a life saver thanks! I can’t thank you enough for taking the time to write this up. It worked perfectly for me, and I am not computer knowlwdgable. I struggled with this for a couple days before finding your page. Perfect timing for the post as aim about to do this as well! Looks straightforward but one quick question – how do I know that I have the correct format for the hardrive? Thanks! If you go to My Computer and right-click on your external hard drive, the file system will be listed just above the pie chart that displays how much space is being used. It’s probably using NTFS, so if you need to reformat it to FAT32, you can close the properties window that you just opened, right-click on the external hard drive again, and select “Format.” This will erase all data currently on the hard drive, so be sure that you don’t have anything important on it when you reformat. Working with an old Mac, running OSX, and when the external drive is plugged into the Mac the only available formats appear to be Mac OS Extended (Journaled), Mac OS Extended, UNIX File System, Windows NT Filesystem, and Windows NT Filesystem (compressed) (which I gather is the NTFS you mention above). Will any of those formats work with a PC. I am able to get my iTunes Music onto the external drive, but then when I plug it into the PC, the PC does not “see” the external drive. Thoughts? Try Windows NT Filesystem. Format the drive as NTFS on the Mac, then see if you can copy the files from the Mac onto it. Your PC should then be able to read the drive. Thanks. I was able to format the external drive in FAT32 (using yet another machine) and got my music onto the target PC. The lone problem remaining is that the target PC would not import my library.xml document and thus will not organize my library into the playlists. When I try to import the library doc, target PC iTunes says cannot recognize or import the document. Any ideas? Josh, this is great so many thanks but I’m operating a virtual Win XP environment on my iMac using Parallels 7. I now want to run iTunes on the Win XP virtual environment so how do I copy all my music & apps in the iMac iTunes across to the virtual environment on the same computer? I also want to sync my iPad to this new virtual iTunes because an app I want to use only works in a Win version of iTunes. I haven’t used Parallels so I’m not 100% sure, but I imagine the process would be the same. From the OS X environment, copy your library to an external hard drive. Then from your Win XP environment, copy your library from the external hard drive onto your Win XP’s virtual hard drive. I’ve only done this on Windows 7, so there may be some small differences in folder names and locations on Win XP that you’ll have to account for. Keep in mind that this method will in effect double the amount of hard drive space that your iTunes library takes up because you’ll have two libraries; one on OS X and one on Win XP, and they won’t be in sync. There may also be a way for Win XP to “see” the iTunes library on OS X without moving it, depending on the capabilities of Parallels. This was great. Thanks for posting this work flow. I did have to manually link one track and then iTunes found the rest. The only problem I have encountered are tracks with foreign characters in the name. I guess the two operating systems encode them differently. I’ve had to manually relink them. Good to hear it worked for you, and thanks for posting the info about the foreign characters. As an alternate to the method you describe for transfering iTunes from Mac to PC, could I burn the music to CDs instead? What is the downside? If you’re burning the files to a blank CD or DVD as data (i.e. not as an audio CD) then there’s nothing wrong with that other than it takes longer and uses up blank discs. Thanks! It worked when I chose mp3 from Toast. Is there a loss in quality? Thank you very much for this wonderful article. It really helped consolidate somethings I’d already guessed and answered a few questions I had. It was simple and easy to understand and had a perfect personal touch too. I’m feeling far more confident about transferring my data across without losing my highscores on Angry Birds. Thanks heaps! Wow, thank you for this clear and comprehensive guide! A quick question – I can’t see ‘contacts’ anywhere in the copied iTunes folder. Is this correct or am I missing something? I’m loathe to commit to the sync until I know these are safe! Thank you very much! Very helpful and all worked as planned. Phew! Just wanted to say a big thank you for this tutorial mate, you’ve saved me a lot of hassle locating all of my bloody songs! The guide worked perfectly! Although I am having one specific issue dealing with artwork. If I view my music library in grid view, the album artwork appears as if its “blanked” out or white. But yet I can click the artwork viewer in the bottom left corner and the artwork appears fine. Also if I were to edit the ID3 tags in itunes the artwork appears properly. Any ideas what can be causing this? I didn’t encounter any behavior like that when I wrote these instructions, but I did recommend creating a backup of your iDevice on the original computer so you can always restore it if necessary. Check out http://lifehacker.com/5954309/how-to-transfer-everything-from-your-iphone-to-itunes-on-a-new-computer and look at the Apps section. 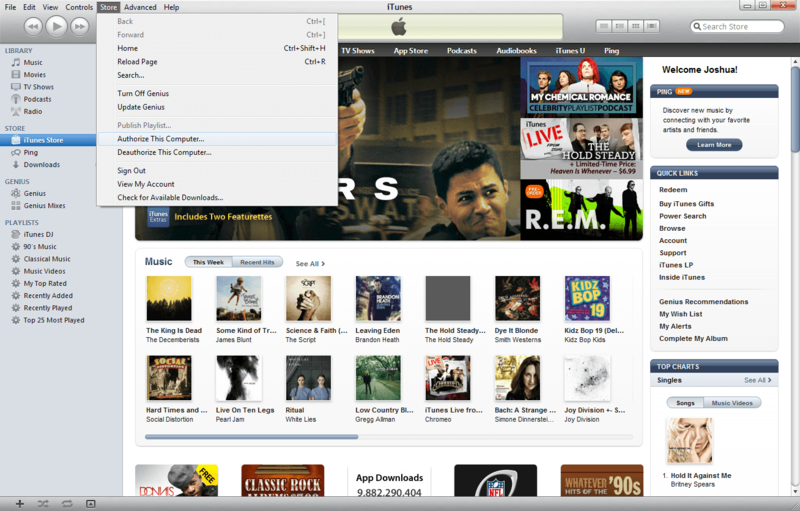 iTunes 11 has a different UI than previous versions, so the sidebar is not visible by default (but you can show it). Also, if you’re backed up to iCloud you shouldn’t have to worry about your apps (but don’t hold me to that). Thanks so much man! Apple obviously didnt want people leaving them for a pc :P, but this really helps! Many thanks for taking the time to post this – it was just what I needed. Oh man!! this just made my day. Thanks for putting in the time to write the guide. Cheers!! Still don’t get it. At one. point you say to open itunes again.,When did you turn it off? Also i have a new pc with windows 8. Is there a new way to transfer on that format? In step one you open iTunes to let it create default folders (this would be if you’ve never used it on a new computer). After that you would close it and then reopen it later in step 5. I’m not sure if these steps would work in Windows 8 but it’s possible. Maybe a few folder paths are different. These days I use iTunes Match which keeps my library synced on all of my devices, and I have not upgraded to Windows 8 yet.